Author(s) Scarborough, Norman; Cornwall, Jeffrey, R.
For undergraduate and graduate courses in entrepreneurship and/or small business management. Discover how to successfully launch and manage a small business. Open your students’ minds to the possibilities, challenges, and rewards of becoming a small business owner with Entrepreneurship and Effective Small Business Management. 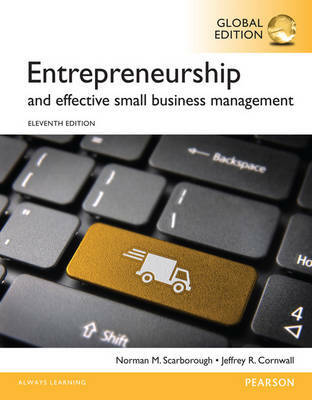 This text provides students with the tools they need in order to launch and manage a small business. This 11th Edition continues to provide students with a practical, hands-on approach to launch a business that has the greatest chance for success. This edition features ten new cases and the most recent statistics, studies, surveys, and research about entrepreneurship and small business management.